According the 2010 Global Burden of Disease study, chronic kidney disease was ranked 27th in the list of causes of total number of deaths worldwide in 1990, but rose to 18th in 2010. This degree of movement up the list was second only to that for HIV and AIDs. As per National Kidney Foundation, about 10% of the population worldwide is affected by chronic kidney disease (CKD), and millions die each year because they do not have access to affordable treatment. Chronic kidney disease (CKD) is a progressive loss in kidney function over a period of months or years. Each of your kidneys has about a million tiny filters, called nephrons. If nephrons are damaged, they stop working. For a while, healthy nephrons can take on the extra work. But if the damage continues, more and more nephrons shut down. After a certain point, the nephrons that are left cannot filter your blood well enough to keep you healthy. The Kidney Project led by Shuvo Roy, PhD, a bioengineer and faculty member in the Department of Bioengineering and Therapeutic Sciences, Schools of Pharmacy and Medicine, University of California, San Francisco (UCSF). The project is co-directed by William Fissell, MD, at Vanderbilt University Medical Center. They are developing a bioartificial kidney to perform the vast majority of the filtration, balancing, and other biological functions of the natural kidney. The two-part device leverages recent developments in silicon nanotechnology, membrane filtration, and cell science. It is powered by the body’s own blood pressure without the need for external tubes and tethers or immunosuppressant drugs. The bioartificial kidney will give ESRD patients new hope beyond the short-term solution of renal dialysis and the longer-term, but impermanent, solution of a living kidney transplant for which donor organs are limited. Chronic kidney disease (CKD) is the slow, progressive loss of kidney function over time. The last stage of CKD, known as end stage renal disease (ESRD), is a near-complete-to-total kidney failure. As a result, the kidneys cannot perform their normal, life-essential roles. Dialysis was first used to treat a patient with ESRD in 1943; the first kidney transplant was performed in 1962. Since then, there have been advances in both dialysis technology and transplant surgery, as well as in the development of immunosuppressant drugs, but little progress has been made in alternative treatment options. Shuvo Roy discusses the bioartificial kidney by Skype on Future Day March 1st, 2015 at the University of Alberta in Edmonton, Canada as as part of the Technology and Future of Medicine course. 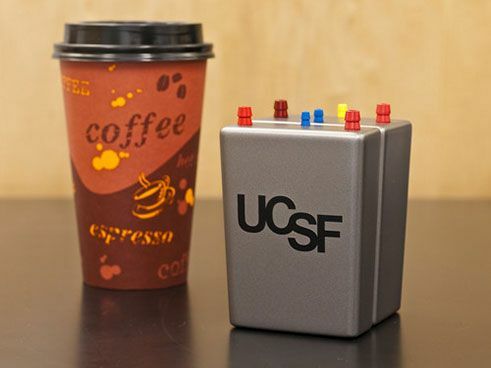 The bioartificial kidney is a coffee-cup-sized device. It will be surgically implanted, free-standing without the need for tubes or tethers, powered by the patient’s own blood pressure, and require no anti-rejection drugs. It will perform many of the metabolic, endocrine, and immunological functions of a healthy kidney. They have completed Phase 1 of the development and are now in Phase 2, fine-tuning the device components, ensuring safety, and scaling for manufacturing. 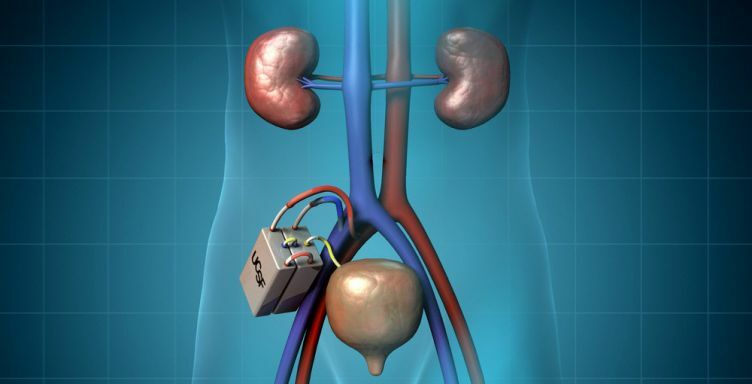 They are aiming to take the bioartificial kidney into first-in-human testing by 2017. As per their site, the Phase 2 will require $3 million per year. To meet this deadline, they will rely increasingly on donations from individuals and private institutions. Every gift, therefore, to The Kidney Project could save and improve the lives of patients with end stage renal disease. Please visit to ‘The Kidney Project’ for additional information on private support and partnership opportunities for the Kidney Project.